If the only horns you expect to see in Canada are on moose, elk, and/or bison, you’d better think again. 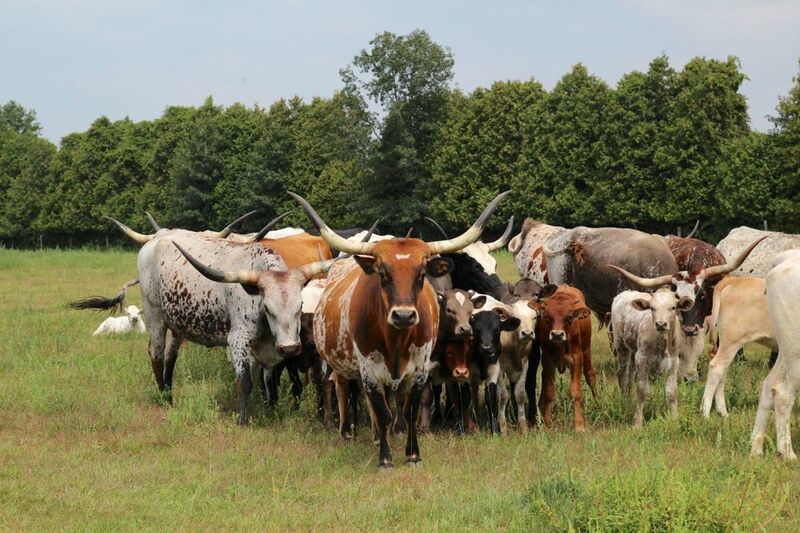 Here’s the baddest cattle out there: Texas Longhorns. While they’re native to Texas, this breed is now raised in parts of Europe, Australia, and across North America, including Ontario. We got to see them close up when we visited Cathy and Bryan Gilvesy, owners of YU Ranch in Norfolk County. Originally tobacco farmers (a crop in the region since the 20’s), they began raising Texas Longhorns about fifteen years ago, and now operate a farm based strongly on principles of sustainability and environmental stewardship. Of YU Ranch’s 100 hectares, 45 are preserved as Carolinian Canadian woodlot, and native plants, grasses, and flowers have been re-introduced to the land; this encourages both the local ecosystem, provides food for the cattle to eat, and feeds pollinators. As an ALUS (Alternative Land Use Services) demonstration farm, Bryan and Cathy have also planted windbreaker hedgerows with native species, brought in bluebird nesting boxes, and reforested with native trees. Additionally, they use solar power to pump water to the cattle, therefore keeping the animals out of the stream and woodlot. While the Texas Longhorn population was once at risk due to market demand for tallow, they’re now highly valued for their lean meat, and their ability to survive under a range of conditions with no hormones or steroids. Also, their variety in colours and terrifyingly large horns mean they’re just amazing to look at. 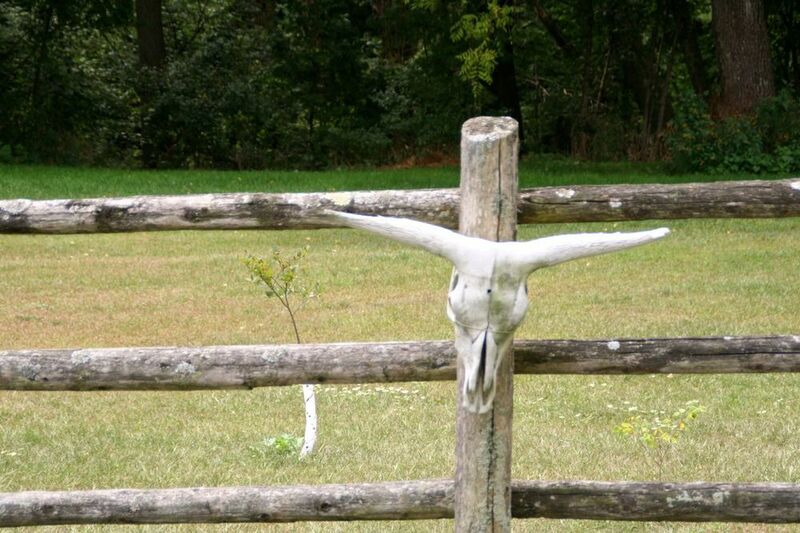 My guess is that no teenagers have ever attempted to cow-tip a Texas Longhorn in the middle of the night. Cathy and Bryan sell their various cuts of beef directly to consumers, as well as to local restaurants. Each year, they team up with Chef Tracy Winkworth to host Farm Gate, “a deliberate celebration of locally-grown and produced food and drink.” Wine and food ‘stations’ are setup around the ranch (even in the woods!) and diners get to stroll around and sample all Norfolk County has to offer. We weren’t around for Farm Gate, but Cathy and Bryan did cook us up some of their grass-fed beef hot dogs with buns from the local bakery, and BBQ’d a few small pieces of steak for us to try. It was unbelievably good. Thank you so much to the Gilvesy family for introducing us to their impressive herd, to the Longhorn breed as a whole, and to their ranch. It’s an inspiring and intelligent example of how successful a farm can be when modelled after a natural ecosystem. And now it's our dream to have a Texas Longhorn skull on the front of the FEAST car.